“Advances in biology have laid the groundwork for the development of molecular-based medicine, the identification and correction of molecular errors that underlie disease. 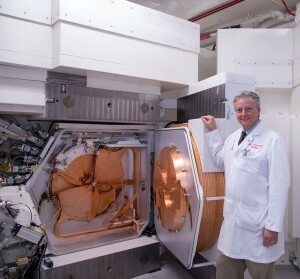 This, coupled with rapidly evolving innovations in imaging and computing technology, is driving a revolution in a scientific specialty referred to as “molecular imaging.” Broadly defined, molecular imaging encompasses non-invasive visualization of the molecular processes of life in organisms ranging in complexity from individual cells to human beings. Molecular imaging appears destined to become the primary mechanism by which new discoveries are translated into clinical use and optimized for individual use. Our comprehensive imaging program has grown to provide core services in biology, chemistry (e.g. novel imaging probe development), radiochemistry, manufacturing and quality and regulatory support. The MIC has an ever-growing series of collaborative interactions between faculties from various faculties within USC and surrounding academic institutions. In addition we have serviced regional biotech/pharmaceutical companies by providing expertise in radiochemistry and small and large animal imaging. Please take a look at our laboratory booklet which provides in-depth information. Jadvar H, Challa S, Quinn DI, Conti PS. Development of PET probes for cancer imaging. Huang R, Wang M, Zhu Y, Conti PS, Chen K.
Curr Top Med Chem. 2015;15(8):795-819. Review. Sodium 18F-fluoride PET/CT of bone, joint, and other disorders. Jadvar H, Desai B, Conti PS. Semin Nucl Med. 2015 Jan;45(1):58-65. doi: 10.1053/j.semnuclmed.2014.07.008. MicroPET imaging of CD13 expression using a (64)Cu-labeled dimeric NGR peptide based on sarcophagine cage. Li G, Wang X, Zong S, Wang J, Conti PS, Chen K.
Mol Pharm. 2014 Nov 3;11(11):3938-46. doi: 10.1021/mp500354x. Epub 2014 Jul 30. NPPB is a novel candidate biomarker expressed by cancer-associated fibroblasts in epithelial ovarian cancer. Lawrenson K, Grun B, Lee N, Mhawech-Fauceglia P, Kan J, Swenson S, Lin YG, Pejovic T, Millstein J, Gayther SA. Int J Cancer. 2015 Mar 15;136(6):1390-401. doi: 10.1002/ijc.29092. Epub 2014 Aug 14. Src as a novel therapeutic target for endometriosis. Lawrenson K, Lee N, Torres HA, Lee JM, Brueggmann D, Rao PN, Noushmehr H, Gayther SA . Gynecol Oncol. 2014 Oct;135(1):100-7. doi: 10.1016/j.ygyno.2014.06.016. Epub 2014 Jun 24. Lang J, Zhu W, Nokes B, Sheth G, Novak P, Fuchs L, Watts G, Futscher B, Mineyev N, Ring A, LeBeau L, Nagle R, Cranmer L.
Sequential administration of carbon nanotubes and near-infrared radiation for the treatment of gliomas. Front Oncol. 2014 Jul 15;4:180. doi: 10.3389/fonc.2014.00180. eCollection 2014. Currently there are no job openings, but we do accept volunteers that wish to gain experience working in the research laboratory environment. Volunteers are not paid, however USC students may be offered a small stipend. Please contact us here if you are interested in working with our imaging center staff and faculty.